A favorite and fun event during the fall is to guess the weight of the pumpkin. 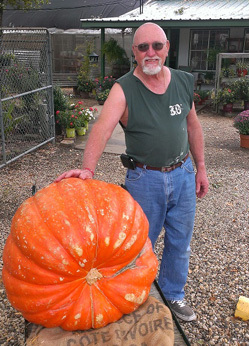 We ship in the largest possible pumpkin we can find from West Texas and place it at the front of the Nursery. Customers are encouraged to guess the weight. No purchase is requireds. The person guessing the correct weight, or the person closest, gets to take home the pumpkin. One hint on guessing the weight, it take two men with muscles to lift it. "Thank you for your friendly customer service & educating me on flowers & veggies"